Hearing reports of Dickcissels and Blue Grosbeaks at Armleder Park, I decided to spend my off day trying to photograph them. I don't get out to this park much, even though I find good birds here just about every time I go. I think it has to do with my need to "escape". The park is in the city of Cincinnati proper. It just feels odd to me to go to the city to see good birds. One can hear sirens and traffic constantly. I can see "big" business from many spots in the park. 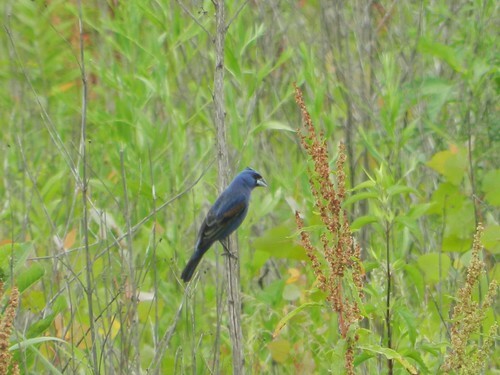 The second bird that I saw when I arrived at the park was a male Blue Grosbeak foraging in one of the parking lots near the front of the park. I tried to use the car as a blind, but the bird flew to the brush immediately. I was only able to get two quick shots out the window. The grosbeak flew off. I was hoping for better pics, but I was just glad to see one. 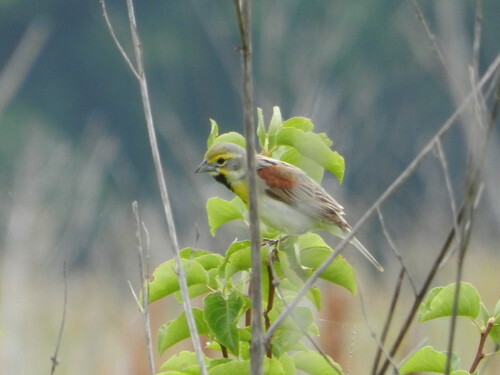 I decided to go to the fields to try my luck at photographing the many Dickcissels I was hearing. I can't recall ever hearing so many Dickcissels here. 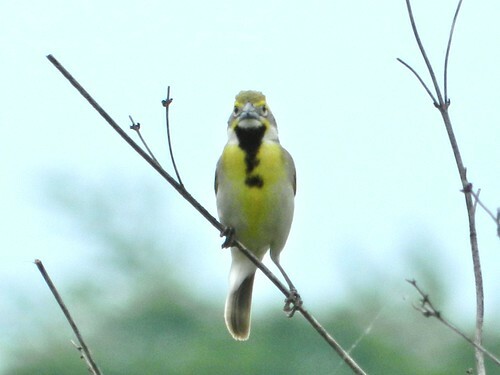 I remember when I got my life Dickcissels at Voice of America Park (VOA) in West Chester, OH. This is the same park that I got my lifer Bobolinks at. VOA looks a lot different then it did back then and I fear for the future of Armleder, as I see the same "things" happening here. The birds are still hanging on at VOA, but they definitely aren't a priority. We as birders must make sure that the birds continue to have a voice. 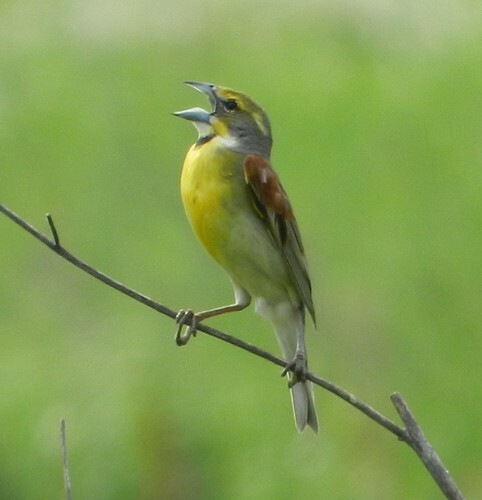 The Dickcissels were more cooperative photo wise than the Blue Grosbeak. I spent a couple of hours just watching and photographing them. Such a nice looking bird! The males were chasing each other and singing for this female. She didn't seem too interested, as she just continued preening. While watching the Dickcissels, I spotted a far off Green Heron perched on a dead tree. At first, I didn't see the other bird. 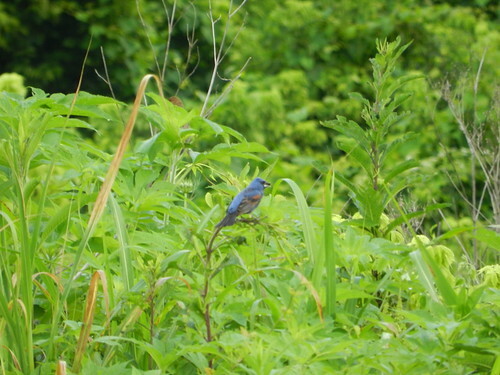 I looked at the pic on my camera and noticed a Blue Grosbeak in the same shot! I went back to see if I could get a better pic of the grosbeak. 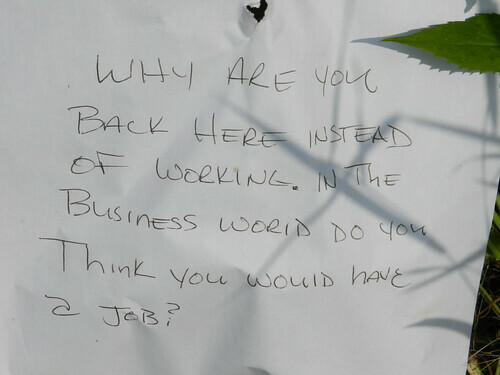 As I went back to near the spot were I first saw the Blue Grosbeak, I found this odd letter on a mowed path. As I stood there, I looked up to see many people going about their day. Most were riding bikes and walking dogs. 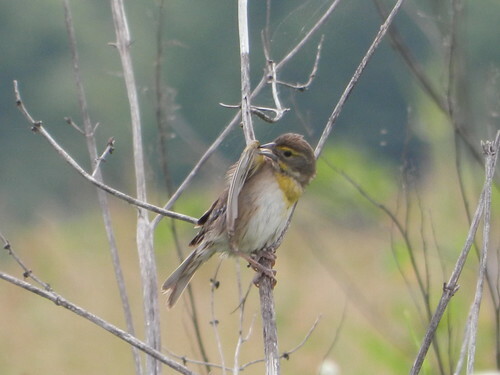 As I was looking at the Dickcissels, I was startled by a bike rider that yelled out that I was walking on the "wrong side" of the bike path. I wasn't on the paved part, as I was in the mowed grass off to the side. It always strikes me that so many people go by and don't notice the nature around them. The mindset that is portrayed in the odd letter above is the same kind of thinking that could evict the birds from their home. I decided to head towards the other end of the park to see what I could find. 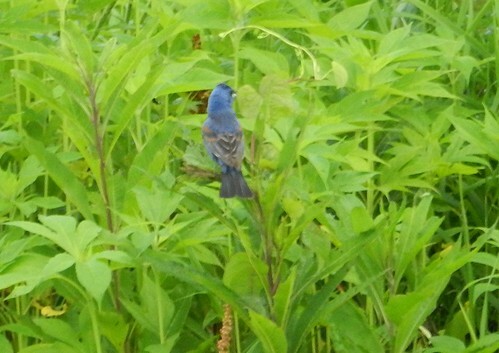 I did run across another Blue Grosbeak. This one was also being very skittish and sneaky, but allowed for a couple brief shots. 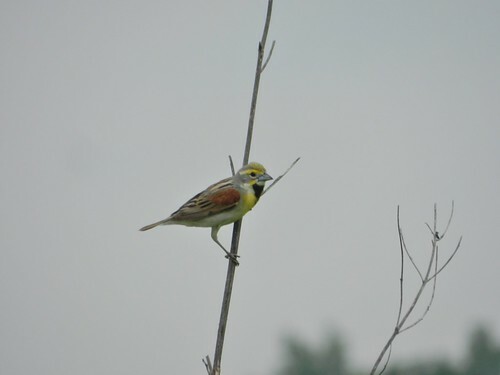 Love your singing Dickcissel shots! Shows that birds don't mind city noises as long as people keep their distance. 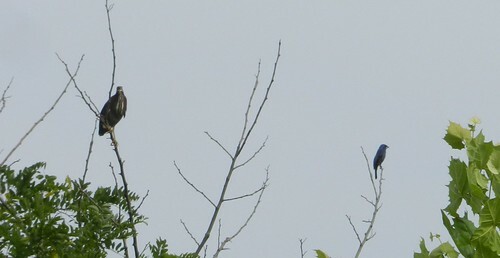 Right in the same vicinity we had some nesting Blue Grosbeaks. Both are great birds, but the Blue Grosbeaks occur annually in Utah, but Dickcissels are rarities here. Makes me wonder if there are any connections between Blue Grosbeaks and Dickcissels. I'll look into the eBird data and see what I find out. 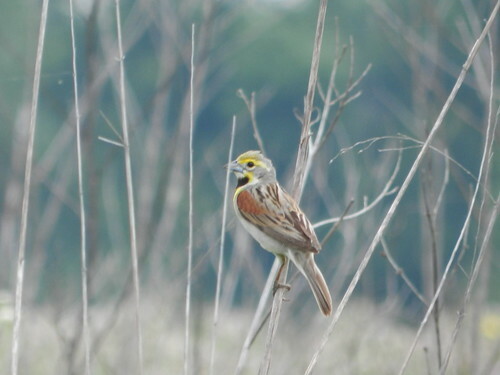 Great photos of the Dickcissels! 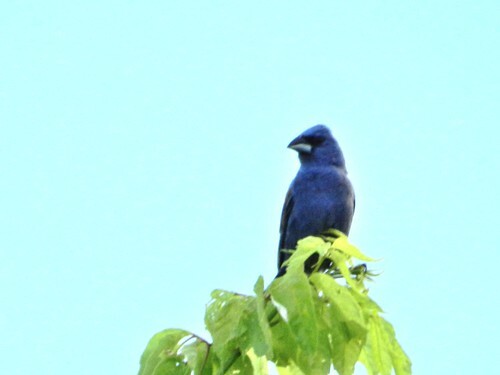 I had a brief look at one once bt was never able to see a Blue Grosbeak. It's cool that you captured photos of them. 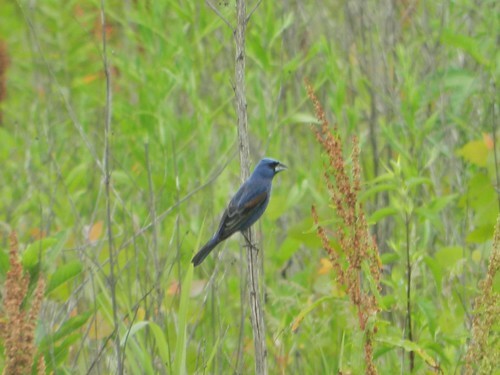 Oh what a joy to see so many Blue Grosbeaks and Dickcissels. Both are very attractive birds. Your photographs are terrific! It's amazing what beautiful birds you can find in the city. 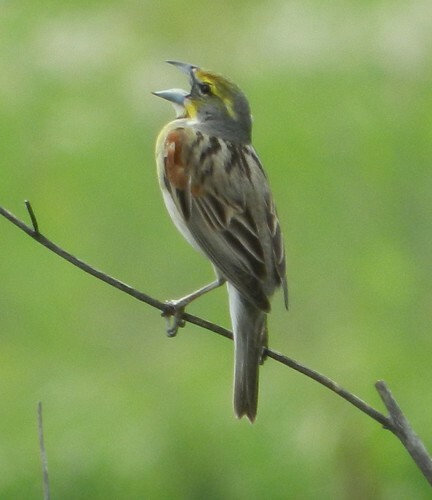 Love the singing poses of the Dickcissels! wonderful photos. I find it interesting too how many people don't really have their eyes open to what is around them.